The Rotary Club of Cranleigh supports many local charities. The latest beneficiary is Melody Memories, a singing group that meets fortnightly to entertain dementai sufferers and their carers who live in Cranleigh and its surrounds. Run by an experienced and supportive team, the group provides "a warm welcome and lots of laughter". 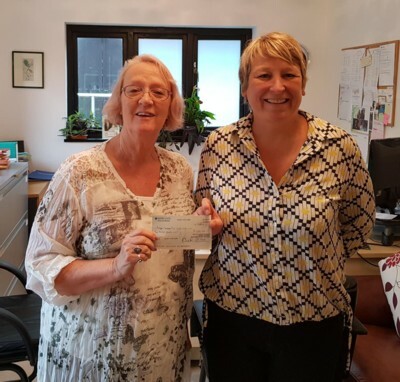 Rotarian Jane Briggs was delighted to present a cheque for £200 to Camilla Ford, one of the Melody Memories lead organisers, on 12 September. The charity says: "Whilst services for people with dementia have been expanding within the area for a long time, this group has been the only point of contact for this vulnerable client group and has provided a highly valued service for those who attend. "The group has been running successfully for three years with funding from Waverley, Surrey and latterly the Community Foundation for Surrey but since the Waverley Voluntary Commissioning strand of funding has come to an end we are experiencing a funding gap whilst we try to reapply for funding from CFS for a further year."